Don’t cancel your T-Mobile service just yet! Pizza is coming! 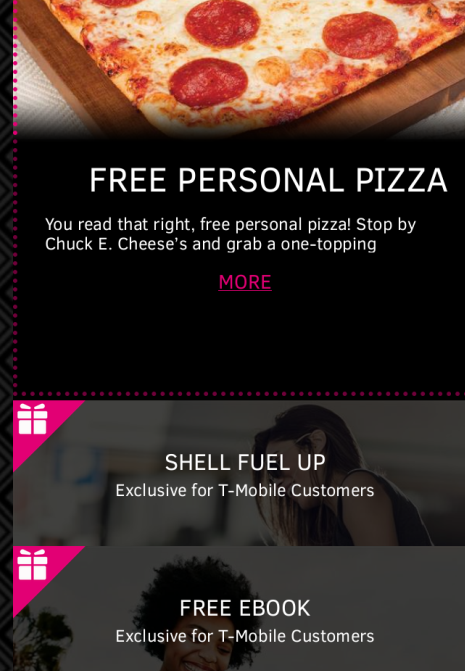 According to the teasers for the Tuesday May 23 (2017) freebies (as part of the T-Mobile Tuesdays program), you can get a FREE 1-topping personal pizza at Chuck E. Cheese’s! This is per line, so if you have multiple lines, multiple pizzas (in theory at least; you may want to be discrete about it). The other freebies are another free ebook from the Book Shout service (which unfortunately can only be read using the Bookshout website or apps, you can’t put it on your Kindle/Kobo/Nook e-readers), and another Shell coupon. Horrible! They locked the door with a sign saying “management has run out of pizza” at 2 pm in the afternoon. How can that be possible if all the kids are in school and its not even dinner time yet? I just stunk of employees not wanting to do the extra work to feed t-mobile users coming in, I suspect. This was worse than when dominos ran out of pizza. T-mobile! You are paying Chuck. E. Cheese to rip you and your customers off or what? That’s crazy! That sounds even worse than what happened when they offered Domino’s during the early days of this program. They tried a different approach when they offered Papa Johns, they divided the customers in four weekly groups, and the coupons were good for a whole week, instead of a single day, so the load on the local pizza stores was spread out over four weeks. I was surprised they didn’t do that with Chuck E. Cheese given what they went through with Domino’s and Papa John. They may try to make it right in next week’s. In the past, they sometimes attempted to re-do things that failed. But regardless, this is very frustrating, considering this is a T-Mobile gift to its paying customers. People shouldn’t have to jump through hoops for a gift!